Anyone seen this? 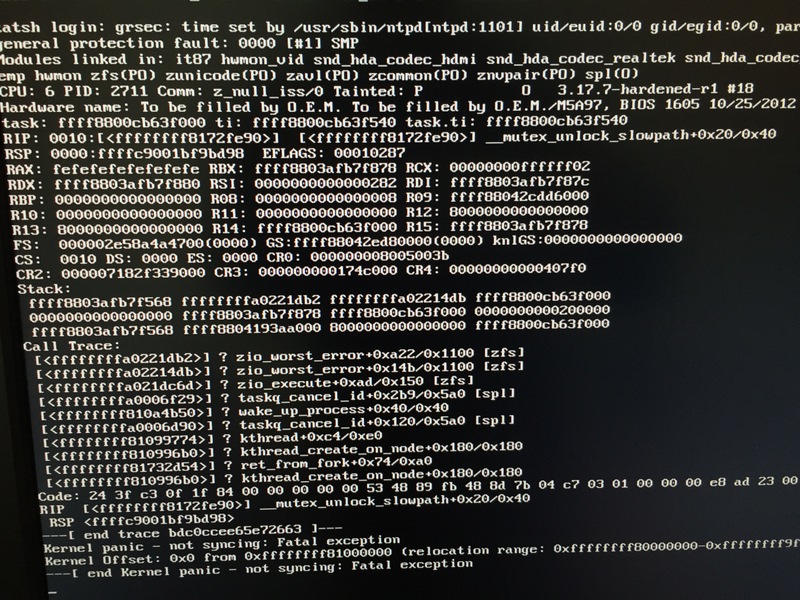 And is there just something security related (PaX) in the kernel I need to disable? I disabled all the ones that Portage tells me to but maybe there are even more? Or maybe something to enable? I've considered switching back to non-hardened just to see what happens, but not yet. The backtrace seems to blame zfs. Can you reproduce with an untainted kernel? No, I mean a kernel not tainted by loading Proprietary and/or Out-of-tree modules. The kernel records events that can indicate that a future crash is the consequence of prior problems. Some out-of-tree modules are notorious for their reliability problems, so the kernel flags any report that happened with such a module loaded. I got a response from ryao in IRC that the bug is known, but is rare too. It is on his TODO list to backport the fix. So I will live on 9999 for now.